Prospective volunteers for the Glasgow 2014 Commonwealth Games have from today until 28th February to apply. No previous Games experience is necessary. Organisers are looking for helpful, friendly people who will be aged 16 or over by 28th February. Volunteers must be eligible to work in the UK and be available for at least eight days during the Games, which take place between 23rd July and 3rd August 2014. Volunteers must be available for up to six days ahead of the Games for interviews in Glasgow, training and uniform collection. Glasgow 2014 also requires volunteers with a range of specialist skills including medical staff, drivers and people with specific sports expertise. Applications can be made online at www.glasgow2014.com/volunteer and help is available in person at the Volunteer Centre in Glasgow or by phone via the Glasgow 2014 Contact Centre. Staff at every library in Scotland are also geared up to assist with the application process. 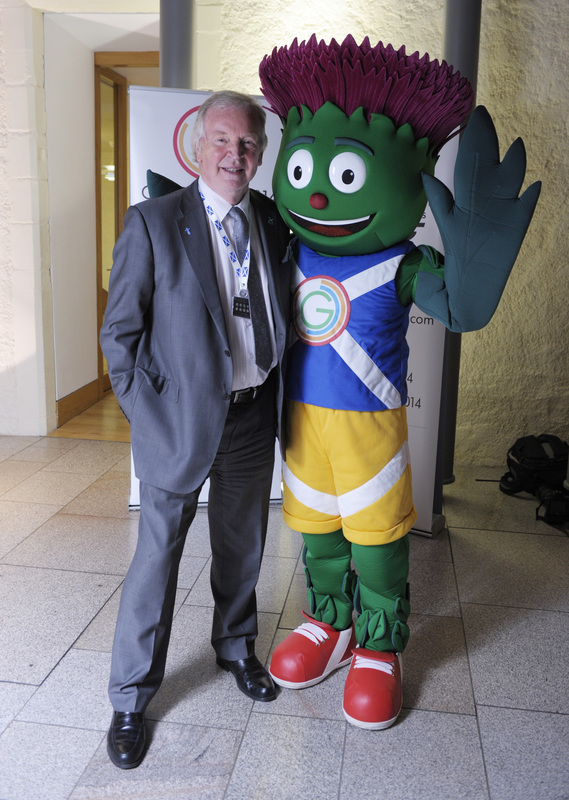 MSPs in the Scottish Parliament recently had a chance to meet Clyde, the thistle-inspired mascot of the Glasgow 2014 Commonwealth Games. Clyde, designed by 12-year-old Beth Gilmour of Cumbernauld, will be visiting Scottish communities throughout the journey to the Games and will play a major role in key moments. I hope he will inspire children and young people to get involved in Scotland’s largest ever sporting event. “Thistle-man” Clyde, official mascot of the Glasgow 2014 Commonwealth Games, dropped into the Scottish Parliament recently to give MSPs a progress update.